New Year celebration, Rot Nam Dam Hua, a traditional way to celebrate with elders. 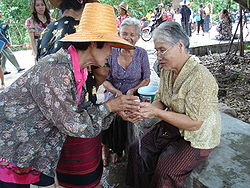 Most Thai people go back to their hometowns to meet their elders. Phraya Anuman Ratchathon (Yong Sathiankoset). (1954). "Amusements During Songkran Festival". Journal of the Siam Society (volume 42, part 1). pages 39–43.